Well what can I say. This is where my facination with anime pretty much began. To me Akira is special. While watching it, you feel as if you are watching a pivotal moment in anime history. What do I mean? Well for a start, if it wasn't animated and was live action, you could easily believe that you were watching an epic film. The sort that only come around once every few years like Blade Runner or Gladiator. What makes Akira special becomes more apparent when you watch other anime. There have been other pivotal films in the history of anime, like Ghost in the Shell. Yes they are also good, but to me, it seems like they haven't got that extra something that Akira seems to have. Well, that's in my opinion. So is Akira the best thing ever created in Anime? Well I sure as hell don't know. But hey! It's gotta be up there doesn't it? unfolds of human experimentation, political and social unrest and who exactly Akira, the perfect test subject, is. Kaneda Shotaro: The hero of the story but also a drug-taking street punk, who spends most of his time fighting other gangs, particularly the 'clowns', while riding around on his bike. And boy is it a fantastic bike. It's probably the best-looking bike in anime. 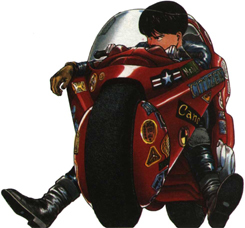 Tetsuo Shima: He is always envious of Kaneda and believes he can do anything that Kaneda can. But you learn that this envy, as spiteful as it first seems, is more about admiration than hatred. Near the end of the movie he, calls out to Kaneda to help him, despite him having extraordinary powers. Showing that he is inside, still the little kid when he and Kaneda first met. Kei: The girl Kaneda is always chasing after. She works with Ryu in a resistance movement. She becomes an important character as she is used as a vessel by the other children who were subjected to the same experiments as Akira. Ryu: This guy was the first character I had heard of named Ryu other than Ryu from Street Fighter. He is the leader of a resistance movement. The Espars: These are the child to whom have been genetically enhanced. Kioko, no.25 - the girl lying in bed. Takashi, no. 26 - the boy who was almost run over by Tetsuo. Masaru, no.27 - chubby person who is always in a flying chair of sorts. The Colonel (Shikishima): He is the one in charge of the project and becomes rather concerned when Tetsuo begins to show the traits in power shown by Akira.